First thing's first, as Andy mentioned in the video above, this book isn't about acting. It's about how to be an actor. Big difference, and I didn't realise that when I bought it. 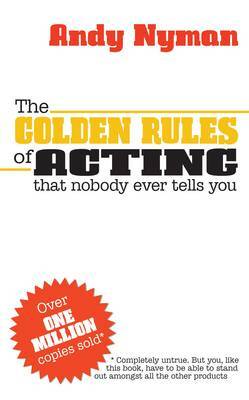 I wasn't sure what to expect, I assumed it'd be a decent sized book with lengthy chapters on acting formulas. I was completely wrong, and glad. Instead, it's perfectly sized and packed with complete gold. Some people might have been put off by what I said earlier. The part about it being about how to be an actor. But here's the thing...at least 95% (if not more) of this book applies to animators/artists/creatives/freelancers. Going to drama school (higher education animation course), auditions (interviews), the business (the industry), agents (agencies), living the life, directors (directors and leads), surviving, how to make it happen and how to take reviews. "Be happy, you'll work more." In conclusion, this is a lovely little book full of positive hints, tips and thoughts. You can read it in no time and revisiting the text for inspiration isn't a chore. Andy Nyman points out some really obvious things, things that sometimes are too hard to see when our every day worries are bouncing around our heads. You'd be crazy not to buy this book, especially since it won't break the bank.